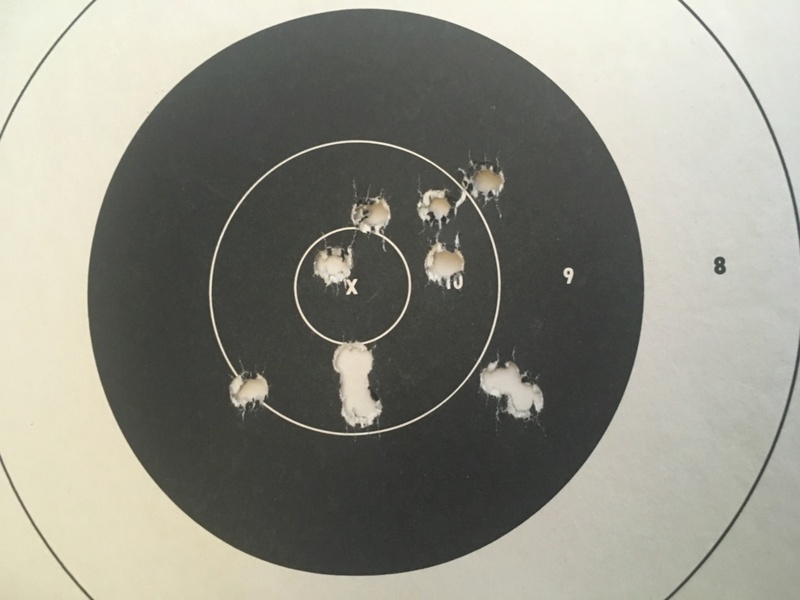 I finally made it to the range. I loaded up with my portable oxygen bottle and rolled my range box on my walker. You can see my yellow clip-on shooting glasses with the jury-rigged eyeshade over my left eye like the big boys at the Olympics. My range box is a work in progress. I had to stop a few times to sit on my walker and rest. The hallway at Shooter's World must be fifty yards long. I shot on the fifty-yard range, so they must have the rest of the hundred-yard range somewhere. This was the second time in four years that I drove myself on the road. Got to be a sign of progress. 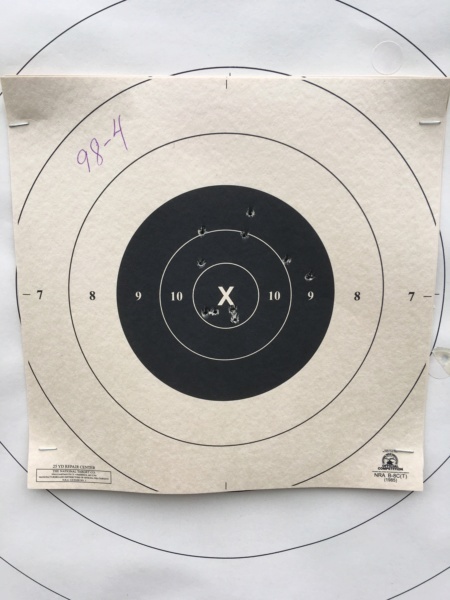 These were seven-inch targets at seven yards, (twenty-one feet.) The targets are named to be sorted in the computer's folder. 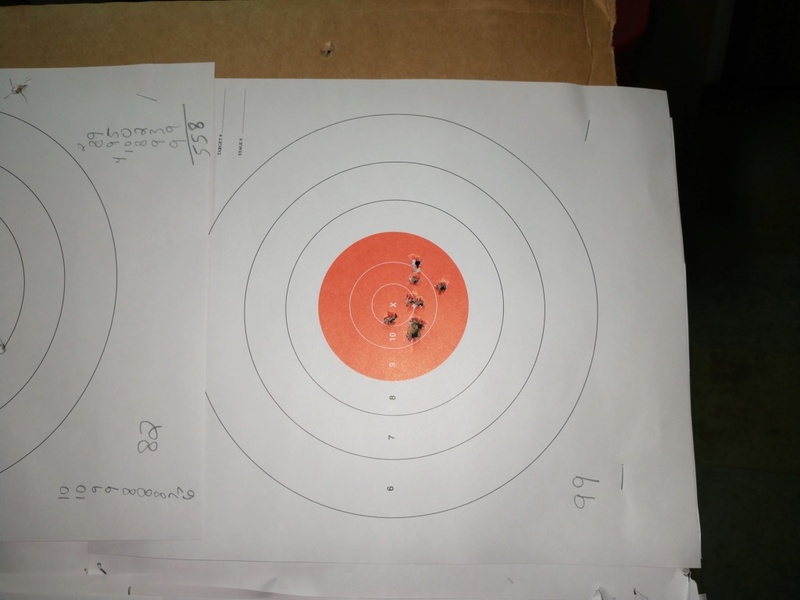 The date, caliber, target number, distance, number of rounds, and grip used make up the title. 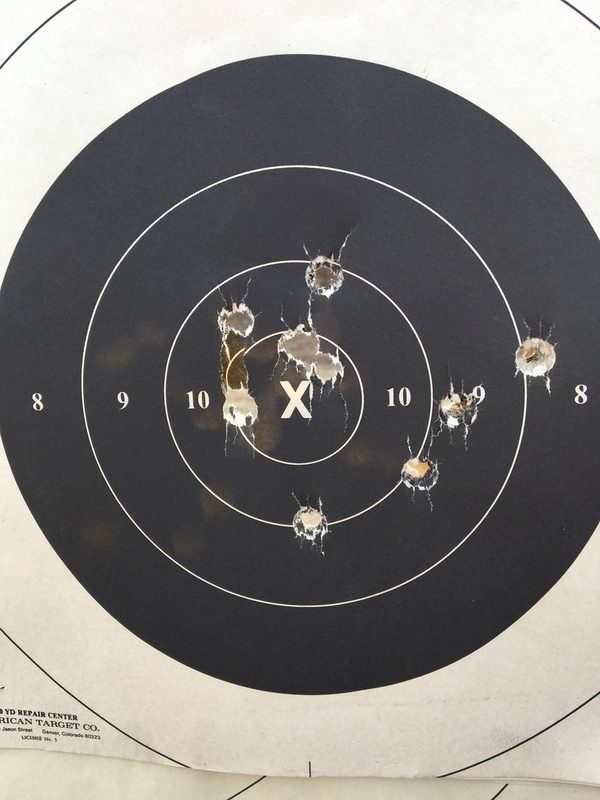 The first target received twenty rounds for sighting in the new Sightmark Wolverine red dot. 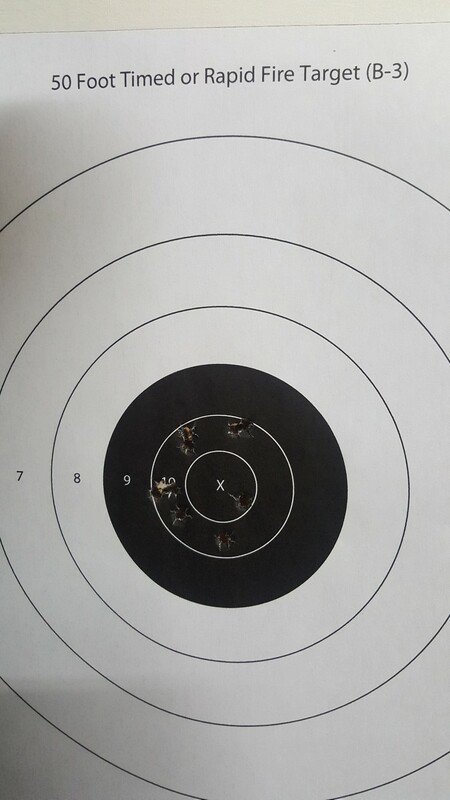 The rest of the targets received ten rounds each and match my performance with my pellet pistol at home. I fired fifty rounds. I plan to obtain some official targets. There is a lot of fun work to be done. Re: Show your targets. Any targets - For instance, First target, or one that shows progress, etc. 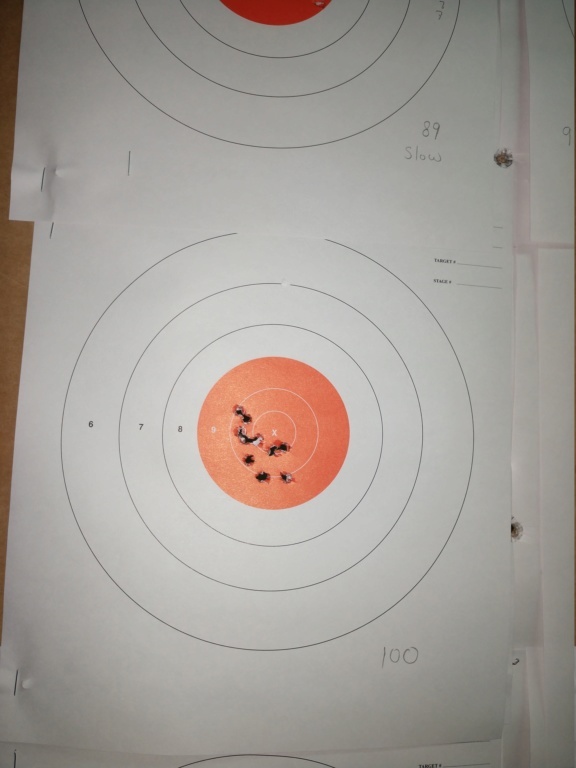 Dardas 160 SWC at 50yd. Shot this one a few hours ago, timed fire, 99-5X which is a personal best. Strange thing about it, this was with my back up pistol, a Ruger MkII that I found in a pawn shop in Wisconsin for $250. Now I have to have a long talk with my Benelli, and ask it what's up? You letting a Ruger show you up? The 100s will come, I just know it. Forever a 99, never a 100! Nothing spectacular, but I could never do this before all the practice with 22 only. 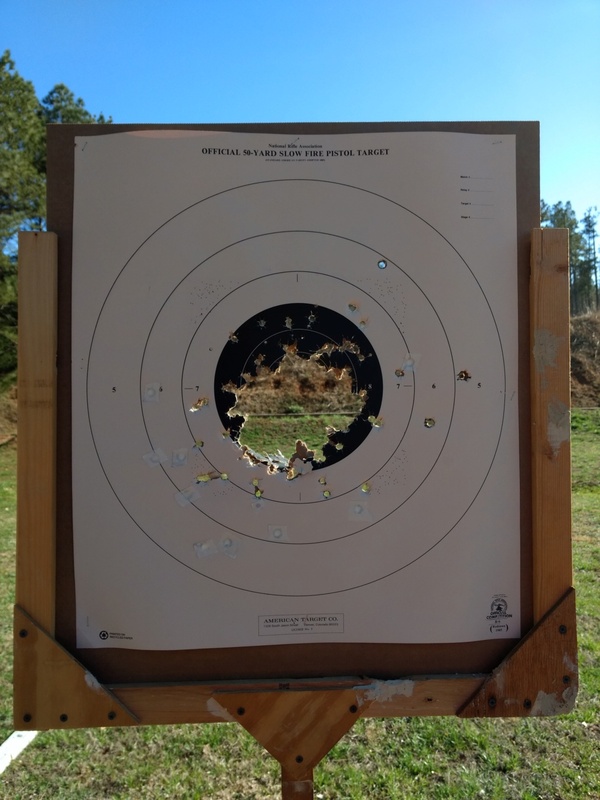 Salyer Range Officer, 25 yards, four days ago. 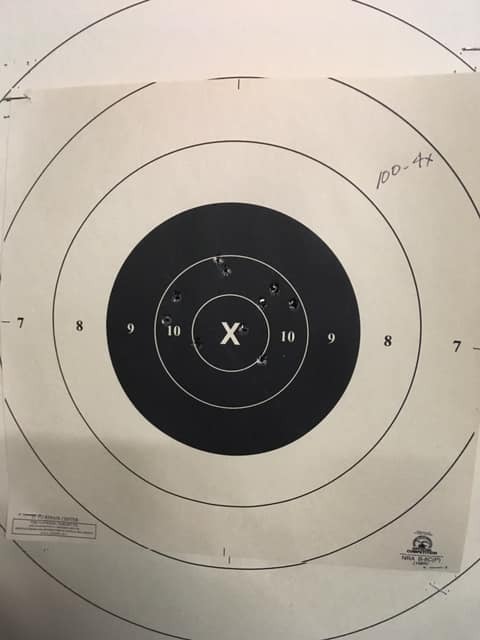 A recent practice with my S&W 25-2. 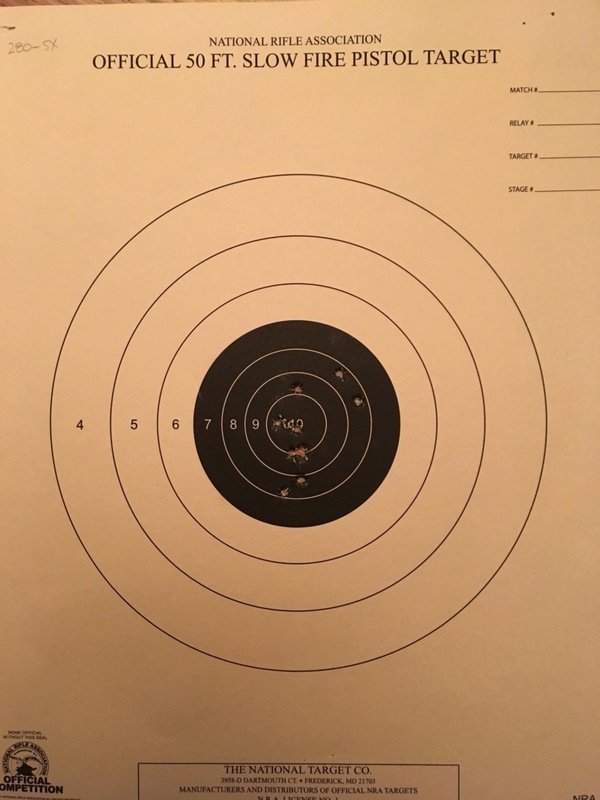 The target is a rifle SR-1 but the 10 ring is almost the same as the B-8. 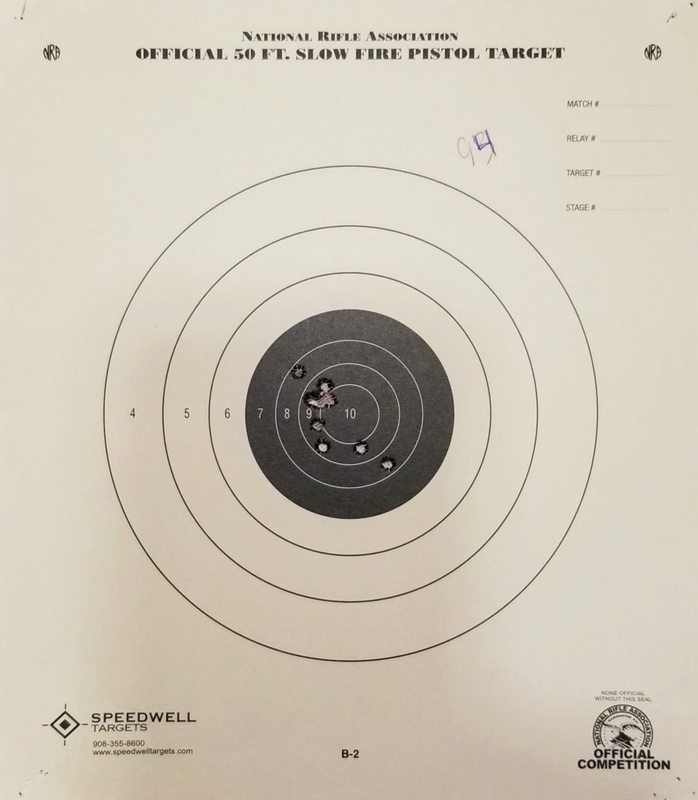 Second time shooting indoor slow fire at 50ft. last night. Sustained fire is finally coming around... Practice timed fire at 50 feet. Nelson on a Caspian frame with a KC drop in trigger. Got me pretty excited! I created a new account as I could not get into my old one no matter what I tried. Had a great simulated match practice today. Scored a 100 and a 99 in rapid fire. 558 total. This is a really good score for me, hopefully i can keep my mojo during Thursday's match. Good job! Might want to come down a click or three. This target is an important milestone for me. 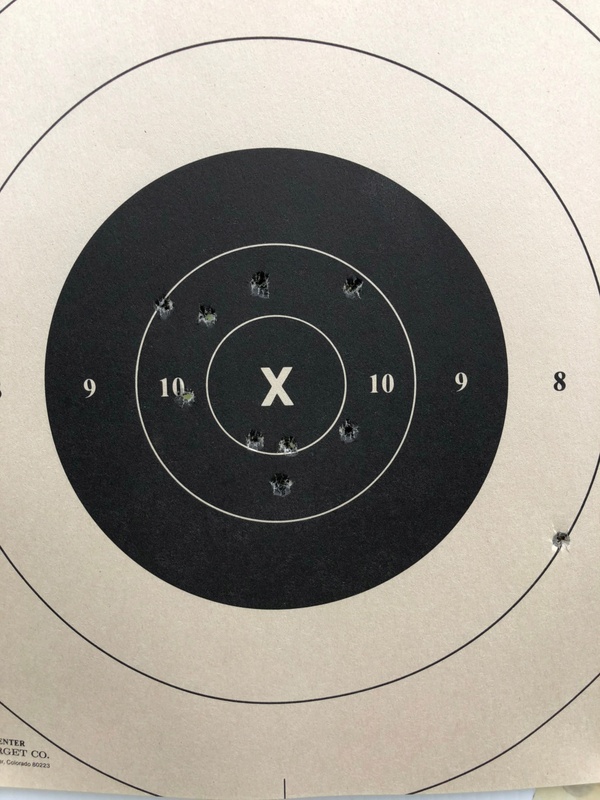 First, it is the best slow fire target I shot at 50 Feet. 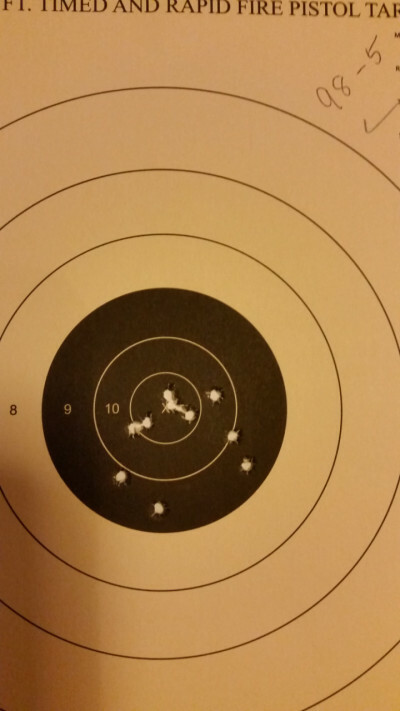 Second, I shot it this weekend at the Indoor Sectional, where I attained a score of 826-13X. Again, my personal best at 50 Feet. 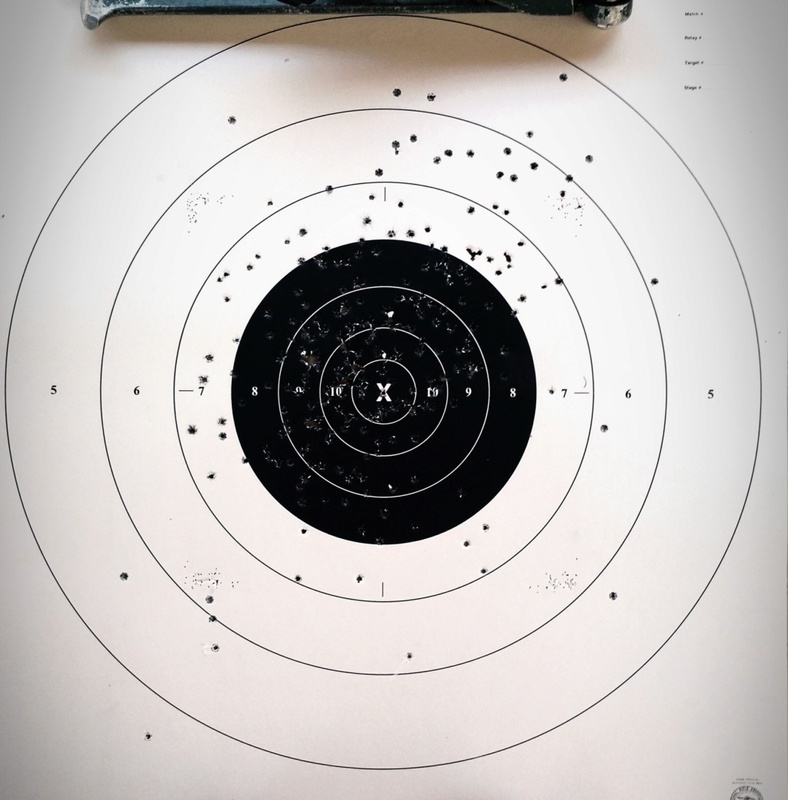 Third and most interesting: I shot no matches from last September until this February (work schedule was very heavy) and had not fired a single shot from late October until mid-February. My tennis (shooter's) elbow got really bad and I had a PRP shot done by the doctor and could not shoot at all. Instead, for about 4 months, I was only training in dry-fire mode, also using SCATT. 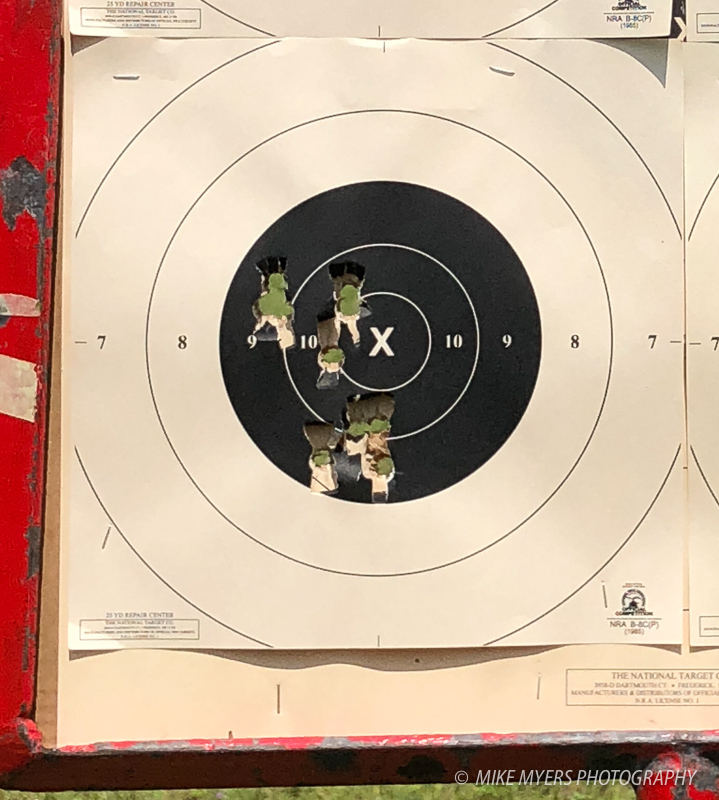 Not that I ever intended it, but life caused me to run a dry-fire only experiment and it worked splendidly - I shot the first 900 match last weekend with a score of 776-7X. After that first match, this weekend I posted a really great score. Dry-fire only training did pose a limitation of focusing on slow fire and neglecting sustained fire (although I worked diligently on one-shot drills). This was the main reason for a lower score last weekend. This weekend, after the first match, sustained fire worked well also. 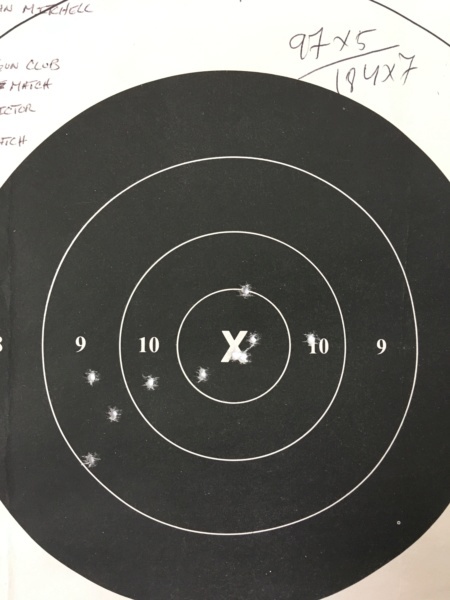 For the remainder of this year I will continue to shoot .22-only (doctor's orders to fully recover). This will allow me to work on my fundamentals with no distraction of the larger calibers. I am looking forward to this opportunity and to return to full 2700 next year. Solid Expert score. 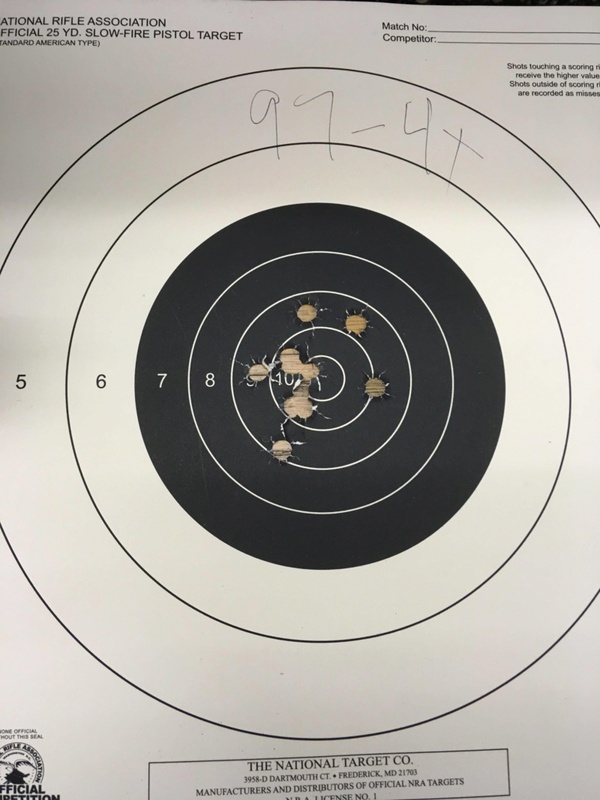 Good shooting. Best slow fire in 20 years. Took a break to focus on raising children and now getting back into it with my youngest. 861 -23x for the evening.